NEED CEUs THIS MONTH? MAY WE HELP? May is the heart of spring. It’s the month that brings flowers after showers and it’s when we celebrate Moms. For many RDs, the end of May also means their re-certification deadline. Need CEUs this month? 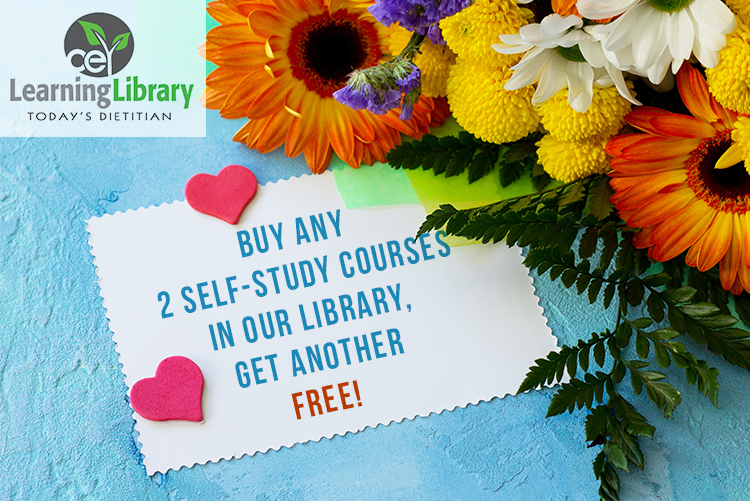 Let us help by offering you a Buy 2 Get 1 Free special on all self-study courses in our Learning Library throughout the month of May. Get the credits you need by choosing your courses and using Coupon Code MAYBUY2 at checkout through May 31st. Take advantage of this deal all month and watch your knowledge base bloom. Visit CE.TodaysDietitian.com for our course catalog. Offer valid through May 31, 2018, at 11:59 PM EDT.